Well now that we are home and have now settled into married life (no different really) and the crap brittish weather, i thought id just say a great big thank you for the amazing wedding you created for us. home, was all fantastic and non of our wedding could not of been achieved without you and your help. a joyus day but because everything that was delivered was so personal and unique. chef for pleasing 40 hungary bellys. gave us had a great time. To be honest it was like being on an excursion. Nothing was too much trouble for him and although his english was little he could still talk the socks of you ! He was fab.I cant thank you all enough including Sharon (my hairdresser) who made me and my bridesmaids look absolutly stunning and who ought to be really proud of her work. for you all as we are planning to spend our 1st anniversary out there.Thank you again Carole for being so dedicated to what you do and for giving us memories that we will never forget. Thanks again and if you ever get a quiet time , dont be a stranger i would love to hear from you. Well weve settled back into reality since coming home from our magical time in Turkey. 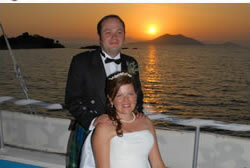 We would just like to say thank you so much for our absolutely perfect and stress free wedding day at the Blue Lagoon. Every part of the whole experience was just perfect, from the day I sent the initial enquiry right the way through to after the wedding. Any questions we had about absolutely anything on the lead up to the wedding day was answered straight away, thank you. The trip to Antalya with Rose went well, it was nice to meet the other couples who were getting married aswell. Also going to Fethiye with you meant we were able to pick exactly what flowers and cake we wanted rather than getting the bulk standard as you would if you married through one of the many tour operators. The actual wedding day was far beyond our expectations, the location was magical, the decorations were perfect, the food was delicious, drinks were flowing and to top it all off the belly dancer was just fabulous. 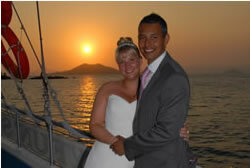 All of our guests enjoyed every moment and have all said how wonderful the day was. The photo album, CD and DVD were great and everyone who has seen them have said how wonderful it looked. 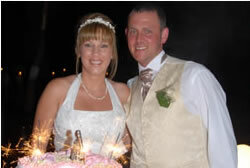 We would like to wish you all the best and would most definitely recommend Carole to organise anybodies wedding. Carly and I just wanted to drop you an e-mail to say many thanks for the wedding. People always talk about their wedding day being the best day of their lives, but this truly was. It surpassed all our greatest expectations and really was a day to remember. We had decided to get married in Turkey because Hisoronu was the placed where we actually got engaged and we thought then that it would be a great place to get married and have a family holiday. 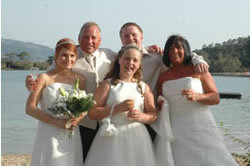 Our original plan was to get married with First Choice and then use Carole for the after-wedding party. However, we were so impressed with the way Carole dealt with our requests we decided to ask her to organise the whole event. The wedding went without a hitch with most of the organising being completed over a refreshing glass of Efes in Fethiye Harbour. This included finalising cake designs, selecting flowers, organising decorative arrangements and also choosing our music and menus. The day was all laid out to absolute perfection and couldnt have been any better, the boat was beautiful, the staff were excellent, the food was delicious and the sunset was out of this world. All the guests who attended our wedding have been saying what a wonderful day it was, with many of them now considering a wedding in Turkey. Tina and I got married on the Blue Lagoon on the 31st of May 2008, we met with Carole the previous summer to start planning. Ours was quite a large wedding for one abroad, as we had about 45 guests, but everything right from completing the paperwork in Antalya through to collecting all our guests from their hotels, the ceremony, the wonderful food, then the disco and ending with getting all of our guests back safely to their hotels was planned and actioned meticulously by Carole. The value for money and quality of the “all inclusive package” was amazing, as was the food and drinks package that Carole organised for us with Alex at the Beach bar. The tables and chairs looked stunning, and so did the gazebo on the beach, the hot buffet was excellent and the disco had everyone on the dance floor. We had such a magical day, we look back at the photo’s and video which were also part of the package, and wish we could do it all over again and if we ever did decide to renew our vows it would definitely be in Olu Deniz with Carole. My wedding day: Carole answered all my emailed questions, and there were many, within a day or so. I thought before I met her that she might be a bit scary, her answers to my emails were very direct. But when I actually met her; hey what a lovely woman; kind, considerate and nothing was a problem. Everything was about what we wanted on our day. I know people say their wedding day was the most special day of their lives, (yep I have had a chuckle about that one too). Actually if I live to be 100, I will always remember my wedding. It was lovely, it was beautiful, it was fantastic, it was so romantic. Carole and her team are superb. I would recommend them to anyone thinking of getting married in Turkey. Carole you were brilliant, brilliant, brilliant. Your organisational skills are 2nd to none. Everything and more than we required was laid out for us, we didnt have to make a single phone call. (Although Carole did give us a Turkish mobile phone for our use to enable us to keep in touch, what more could you ask for). All our guests are still commenting on what a great wedding we had. SO WHAT CAN I SAY: Carol; Thank you, Thank you, Thank you for the most wonderful day of our lives..
Just wanted to say thank you for making our wedding day so special. We had a wonderful evening .You exceeded all our expectations. The decorations were beautiful, the food was delicious and the photogrpahs were great. I’m so glad the cake turned out to be just as I wanted. Feel free to use any of the pictures for your website. I have already recommended to you to everyone. Dear Carole, just a little note to say thanks once again for making our wedding day extra special. Me and Andy had the best time of our lives. It was everything we could wish for and more. We both struggled getting back into the English way of life after having such a relaxing time in turkey and just wished we were still there doing it all over again. Your whole team really were a credit to you, both Anne and Enver made our day in Antalya really memorable and we laughed so much, they were really good company and showed us some real parts of turkey. As for the wedding, From the Hair dresser being so patient to the decorated car and tables and beach,it all really was perfect. Thank you so so much for all the hard work you and your team put into what was an absolutely incredible day, I’m still on cloud nine , the whole day was fabulous with 60 guests , they have all said how incredible the day was, romantic, fun, beautiful , the food was fantastic and the atmosphere electric so thank you so much. We would just like to say that the wedding you arranged for us was the perfect dream wedding. Everything was arranged by you to our specification, ie the colour theme, wedding cake, flowers of our choice. There was no need for us to run around arranging everything everyone needs for a perfect wedding. The venue (a beautiful boat) was prepared for us, the food, photographer, transport, registrar was all sorted by yourself so we could enjoy the first week of our holiday. A trip to the consulate in Turkey arranged with free transport and lunch paid for. 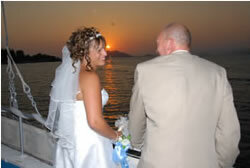 On the day we had a lovely time with the wedding performed on the boat, beautiful scenery with the sun going down creating the perfect picturesque wedding. After the ceremony there was then a really nice buffet spread with free drinks and a DJ with party afterwards all much more perfect than a wedding back home at a price much more affordable. With the really affordable price of jewellery in Turkey we could have rings made to our choice of style at a very good price. Along with ourselves and all the guests who attended the wedding, all agreed it was the perfect dream wedding. 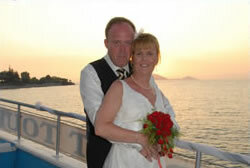 If anyone is reading this message a wedding in Turkey arranged with Carole is highly recommended. J”We wanted the boat wedding even though we only had a small party of 7 and Carole and her team were happy for us to go with this even though a beach wedding is more normal for a party of that size. The idea behind getting married abroad was to escape the hype, stress and dubious weather of a UK wedding and what we got exceeded our expectations completely. I cannot imagine having got married in England in such a stress-free way. Carole and her team made everythying simple, nothing was too much trouble and there was no pressure to spend more than necessary – it was all about what we wanted and thats what we got, something unique to us and our party. Thanks Carole, use whatever pics you want and I wouldn’t mind any potential clients contacting me at all, wouldn’t hesitate to recommend you. From the day we saw the website and photos of Caroles Weddings we knew that the yacht wedding was the wedding for us. From the initial contact with Carole we were given a friendly, professional and knowledgeable service. Organising a wedding can often be stressful but this was not the case with Carole. She always responded quickly to the many questions we had so we always felt like we were in good hands. All aspects can be arranged easily for you, hair, flowers and photographer, and nothing was too much trouble. The day spent going to the consulate and registrar was made so easy by Ann and Enver, they were so knowledgeable about the formalities and sped us through each part, they were good fun making a long day thoroughly enjoyable. On the day, all the team were discreet but good fun understanding your requirements and subtly guiding you through the proceedings. The boat was dressed in the wedding colours, the food was fantastic, the views were beautiful and the whole experience was perfectly romantic. If i could go back and do it again I wouldnt change a thing! 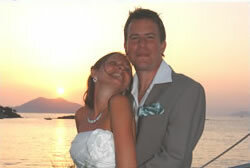 I would recommend this to anyone who wanted a wedding abroad and something different to the norm. All our friends and family that joined us thoroughly enjoyed themselves and 2 months on are still talking about it. It truly was the perfect wedding! “The best wedding we have ever been to” this was the comment from all of our guests. It truely was a unique experience on board the ‘Carole Ann’ with our friends and family plus the audience of tourists that saw us off at the harbour! It was as stressfree as a wedding can be, thanks to your organisational skills. I certainly don’t know of many brides and bridesmaids that have time to have a little dance on the dancefloor before the wedding! The scenery is amazing and the sunset in the photos is stunning. We would recommend the belly dancer as she definately got everyone involved and warmed up for a bit of scottish ceilidh dancing. We would recommend Carole’s wedding to anyone interested in a stressfree wedding who wants guaranteed sunny weather, value for money and a wedding day you and all your guests will remember. 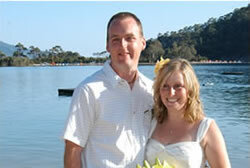 My husband and I wanted to renew our wedding vows so we looked on the Internet and found Carols web site. From start to finish she was helpful, informative and professional. It was all arranged via the Internet which worried me slightly, I need not have worried as everything was done perfectly. We arrived at our hotel and had arranged to meet Carol a few days before the wedding. She took us onto the boat which was beautiful and well decorated, we chose the cake, flowers, food, music. She even gave us a mobile phone so that we could contact her. The day was brilliant Carol took control of everything and took away all the stress and worry of organising a wedding and everything was perfect. The cost included everything we did not have to worry about anything. We compared our day with a Thomas Cook package and Carols was half the price with more included and a better location. I would recommend Carols wedding to anyone and happily include my email address if you require any information. Please find below a testimonial, and accept again our grateful thanks for a splendid ceremony and services provided. 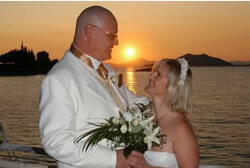 On September 28th 2008, my wife Mary and I (Phill) had our wedding vows renewed at a sunset ceremony held at The Blue Lagoon in, Olu Deniz, Turkey. The civil ceremony was provided by Carole. We started with a wedding car to collect Mary from the hotel where we were staying at 5.45 in the evening and transport for myself and our guests a few minutes earlier. We were all taken to the Blue Lagoon where Carole met myself and our guests and escorted us down to the beach, which had been very beautifully decorated with lights, flowers and ribbons, chairs and arbour, (please see attached pictures). When we were seated and drinks had been purchased and served by the beach bar (excellent, by the way), Mary had arrived and was escorted to the beach by a friend, to music we had supplied to Carole. 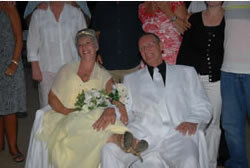 We had a welcome address to our friends, renewal of our vows, toast, followed by photo`s and drinks and as it was both mine and Mary`s birthday that day, Carole provided us with a cake, then the transport arrived to convey us back to our Hotel where we had arranged a party. All speeches, vows were provided by Mary and I. The beach is private although as Sunday is traditionally a holiday for the Turkish people, they cannot be excluded from public places. We, however found that the locals added to our celebrations immensely and were pleased to have them there, they remained in the bar area and watched and were an asset. Mary, our friends and I thoroughly enjoyed the sunset ceremony and can only commend both Carole for everything they did and provided, also for their guidance and skill throughout. With many thanks and continued good wishes for your services and future. From the very first enquiry to the end of our wedding everything went extremely smoothly and it was all due to the marvellous organisational skills of Carole! As well as the major items for our wedding in Turkey, she also looked after all the tiny details which went to make a perfect stress free day. We enjoyed our trip to Antalya to the British Consulate. We passed through some beautiful countryside and mountains and had breakfast en-route which was amazing, homemade honey, bread and cheese and much, much more. 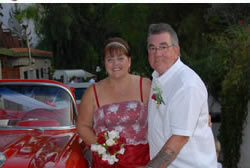 Our Wedding day was wonderful from beginning to end  Carole organised fantastic cars for us  a stretch white Cadilac and a superb red Chevvy (which by coincidence matched my dress)-amazing. We had two photographers during the wedding, one taking a video and the other taking still photos. They were such lovely people, we got on so well with them that we asked them to share our wedding meal with us and they carried on taking photos all evening. We received the album, a CD with all the still pictures taken during the day plus a DVD of the wedding just days later . The quality was superb and it was fantastic value, we couldnt be more pleased. Carole was in attendance at the wedding ceremony. We chose a beach location, there was a carpet to the decorated pagoda lined with torches and the lagoon was just two feet away was just perfect. The whole day was amazing and we will remember it for many years to come. We would recommend Carols wedding services to any one-and if they would like to contact me or Ken my email address is Ruth.Griffiths7@ntlworld.com. THANK YOU CAROLE FOR all your hard work from both of us, YOU MADE OUR SPECIAL DAY PERFECT!!! !